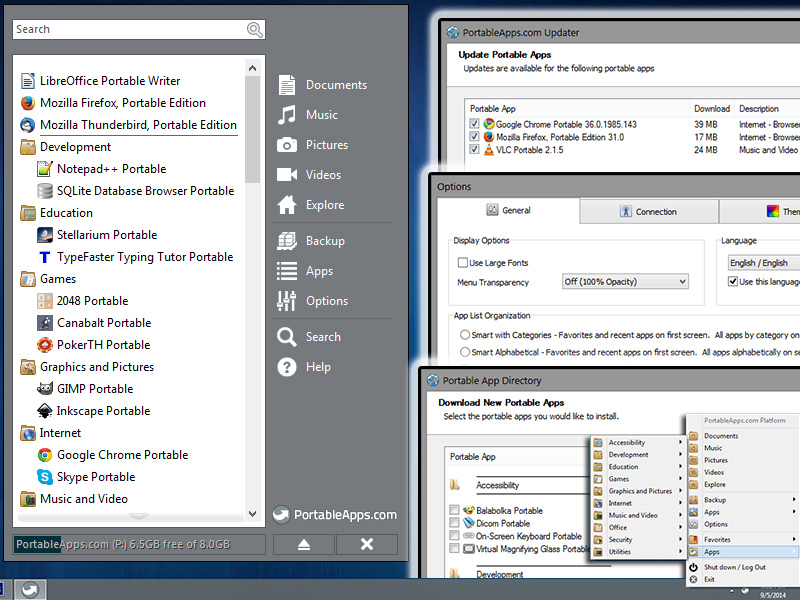 PortableApps.com Platform is an all-in-one tool for portable software download, management and updating. 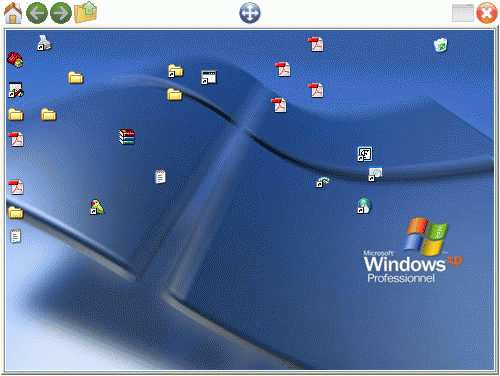 An included launcher shows nested folders organized automatically by function or favorite status, as well as a cascading app view on right-click of the tray icon. The program's appearance can be customized with transparency and several color, texture, and background options. Other tools include a find-as-you-type search functionality, available cloud installation, drive error checker, backup/restore utility, portable fonts, automatic application closing on shutdown and more. The program can also work with portable software outside of the PortableApps format (see Extract instructions). Functional in 64-bit and WINE, includes broad language support and proxy support. To add non-PortableApps applications place the program in its own subfolder under the \PortableApps subfolder and press F5 or restart. The new app will appear in the launcher menu under Other. The PortableApps Platform has been updated (a few times) since this was last updated. Latest version (v15.0) now supports .NET programs, the first of which appears to be KeePass Professional (or 2.x). Task Coach is a simple todo manager to keep track of personal tasks and todo lists. It grew out of a frustration that most task managers do not provide facilities for several activities so Task Coach was designed to deal with composite tasks. In addition, it offers effort tracking, categories and notes. Task Coach Portable includes a PortableApps.com format launcher to handle portablisation. X-Task Coach is also available from the download page. Cross-platform (OS X, Linux, BSD and iOS) with synchronisation features available via the Funambol service. How to extract: Download the "PortableApps Format" self-extracting EXE and extract to a folder of your choice. Launch TaskCoachPortable.exe. SyMenu is a customizeable menu launcher that allows to organize and find your portable applications in a quick and easy way. Moreover, it can automatically link any application residing on host PC. Any linked item (SyItem) can be organized in a hierarchical structure with colorful folders and found with the internal search tool. The Standard for Portable Software (SPS) allows to install, update and remove the programs available in the SyMenu suites automatically, see more in Manual. 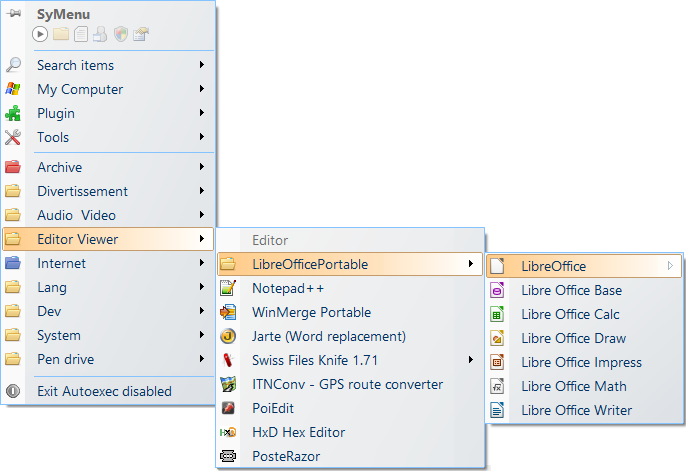 How to extract: Download the ZIP package and extract to a folder of your choice. Launch SyMenu.exe. Why do the dependencies include the administrator rights? SyMenu can work with normal rights too. It can even work from read only supports or network paths. After Avast showed a virus I then checked with Virus Total which gave an 8 out of 54 report as Trojan,key logger etc. In the "Menu" and "Multiple Folders Menu" settings, the program can act like a Program Launcher. Multiple instances of the program can be run with customizable icons and each entry is added to the taskbar. To use the program as a root folder of a portable folder choose Options - Local path, then use a forward slash: "\". To set an image as a background place it in the application folder and set path as "image name.jpg" etc. Right-click the taskbar icon, select Options and uncheck "Launch at Windows Startup"
Bug solved: application crash at application closing when an invalid path was reported (at app startup or config change). Thanks, those are interesting apps. I really find ShortPopUp especially useful.